Over the last year I have been amazed by the epicness of the Starbound series. I started with These Broken Stars at the beginning of the year and was just blown away. I laughed, I cried, and I didn't think any other book in the series could live up to it. I was kind of right. Book two, while also amazing, wasn't quite -as- good as the first. Still, I really loved the story and characters. Now it's on to book three and I was really hopeful for an amazing ending to an amazing series! Their Fractured Light was kind of a unique book in the series. While both of the first two books were mostly focused on one couple, this one was very evenly split between a new romance and the two old ones. While this does appear to be Sofia and Gideon's story on the surface, it wasn't quite. 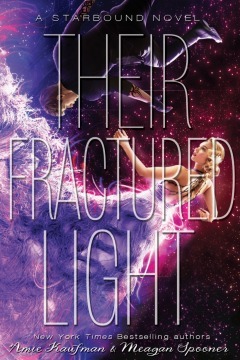 Sofia and Gideon are the primary focus of about the first half of Their Fractured Light. Sofia is a con artist and Gideon is a hacker and they are honestly adorable together. Unfortunately, I didn't connect with them on the same level as I did Lilac and Tarver, or even Jubilee and Flynn. I think my primary issue with Sofia and Gideon is that they didn't have nearly as much time to grow to love each other. It seemed that they went very quickly from completely distrusting each other and never planning to see each other again to being in love. It just wasn't quite believable enough for me. That being said, they both had very interesting backstories and were very sympathetic characters. I also enjoyed how their stories connected to the other books in the series. The final installment of the Starbound series nicely wraps up the mystery of the whispers. I really enjoyed reliving certain aspects of the first two books in the series from the whispers' perspective. I hadn't anticipated coming to care very much about the whispers as characters, but that's exactly what ended up happening. Obviously all four characters from the earlier books were present in the last half of this book and I loved ever second of having them back! My biggest disappointment after reading These Broken Stars was not having Tarver and Lilac in the books, but they were a huge part of this one, and it was amazing! Lilac's relationship to the whispers is a major plot point in this one and it was super interesting to see how that all played out. This book is action start to finish (so basically like the other two). There were a few lags that really slowed down the reading for me, but the abundance of action made up for those. The mission to destroy LaRoux Industries and the man at the helm was a big part of the story and the main point that brings Sofia and Gideon together. LaRoux has been such a villain from the beginning of the series, so it was obviously great to see someone go after him with a vengeance! One of the things I really liked was getting to explore the amazing city on the planet of Corinth. I honestly can't quite picture it in my head, but it sounds incredible! There's an upper city and a lower city and it kind of reminds me of The Fifth Element, but I wish I had a picture! Fan art, anyone? Overall, I thought this was a great end to the series and it wrapped everything up in such an amazing, interconnected way! My main complain is the way the relationship between Sofia and Gideon was sped up to the point of not being believable. Although neither of the subsequent books lived up to These Broken Stars, this was a completely amazing, incredibly unique series! I'm not normally a huge fan of sci-fi, but these books made me a believer! The Starbound trilogy is definitely a must-read and I recommend it to basically every reader I know!